Why the last sentence of the book was removed? All held their peace as the batch, like flower girls in the wilderness, one after the other, were deflowered on a corporate balance sheet, and every one can only hope and wish it works out better than Cuthbertson's catastrophic foray in another foreign field: milk-making in China. This sentence was redacted by the publisher at the request of the whisky baron Chris Malcolm who suggested that publishing it might destroy his personal friendship with Terry Cuthbertson. The impact of this redaction was not merely to save Malcolm embarrassment or shield Terry Cuthbertson from a further reminder his own folly, but to eliminate the consideration of the idea that there are potential dangers in the direction the industry was taking. Removing the sentence removed from consideration the very idea that agglomeration may have a downside, that agglomeration could not merely weaken but even ruin the Tasmanian whisky industry. In 2016 nine Tasmanian distilleries each delivered 20-litres of newmake to the Tasmania Distillery. There, distiller Patrick Maguire solemnised them in a vat and then filled nine virtually identical pin casks. Each cask was returned to a distillery for a short, happy married life. The hope of “The Tasmanian Collection” blended whisky is to isolate the influence of place, but the nuptials parallel an outbreak of polygamy in the industry itself. When whisky making recommenced in the early 1990s its pioneers were mostly penniless men with no more than a backyard, a nest-egg, a pay-out, a grant or a few mum-and-dad investors. One had a wife who had won Tattslotto. The Larks began with $65. (Hellyers Road, Tasmania and Nant—whose dowries cost a million or more—were different, but in the world of whisky they too were kiddliewinks.) Perhaps the pioneers were lucky to get away with their bachelorhood as long as they did. Mead-maker, David Thomas, who was in the craft alcohol industry for a decade before whisky remerged, suggested that if there had been a large whisky distillery in Australia in 1990 it would have opposed and perhaps destroyed any Tasmanian rivals—or arranged a marriage. A defining feature of the whisky industry overseas is conglomeracy. On the back of a hundred Scottish whisky labels are two names: the feuding parent couple: Diageo and Ricard. They own just about every brand you know. Both flirted with Tasmania but no prospect had sufficient dowry. Nevertheless, after a whirlwind courtship, five Tasmanian distilleries that between them make up the bulk of the island’s whisky were hitched. All five are now owned or controlled by two companies, one in Melbourne, Sable, the other in Sydney, the ASX-listed stock company Australian Whisky Holdings (AWH). The chairman of AWH is Terry Cuthbertson. Like so many others, he had been transfixed by a single sentence he heard on TV by Bill Lark. Cuthbertson called up his business partner Chris Malcolm and suggested that as the Australian whisky industry was fragmented consolidation was likely so they should invest. They were attracted to Lark. Lark had already taken on private stockholders and indeed the first distillery had passed out of local control almost a decade earlier when the founder of the Tasmania Distillery sold his company for around $1 million to businessmen living in Canberra. In July 2013 the Larks sold 75 per cent of their shares for close to $5 million. Said part-owner Kristy Lark, “Mum and dad wanted to bring in people who had more experience developing larger businesses.” Former Woolworths’ director Leon L’Huillier chaired a new board of surgeons, stock-broking executives and prominent local businessmen. They courted Overeem Distillery and wed. Lark’s new CEO, the ex-Nant manager John Rochfort, then made bigamous offers to many other distilleries. He even proposed that Betta Milk lead Hellyers Road to his altar. Lark/Overeem’s overtures then attracted their own suitor, AWH, who built up a controlling power over the pair within a year. The coquette was Tasmania Distillery. She had spurned several suitors (Suntory Beam among them) but in 2016 said “I do” to Sable. When Redlands Estate sold, the distillery was homeless. AWH bought a twelve per cent stake in it in 2015. Watch that space. The shotgun wedding was Nant. 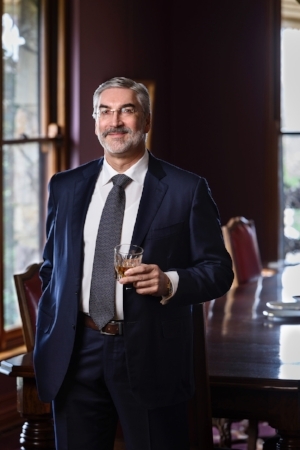 With Keith Batt bankrupt, AWH bought that distillery too in 2016 and AWH chairman Terry Cuthbertson informed the Stock Exchange of his company’s goal: “to be instrumental in defining the final shape of the craft whisky industry in Australia.” With conglomeration came also a powerful block of votes in the Tasmanian Whisky Producers Association. Tasmania has always been dependent on the aid of foreign capital. Investment and expertise facilitate expansion and inspire confidence. Everything can be made bigger, faster, stronger, cheaper; but there was no honey mead, no confetti in the streets at Cuthbertson’s ominous pronouncement. All held their peace as the batch, like flower girls in the wilderness, one after the other, were deflowered on a corporate balance sheet, and every one can only hope and wish it works out better than Cuthbertson's catastrophic foray in another foreign field: milk-making in China.